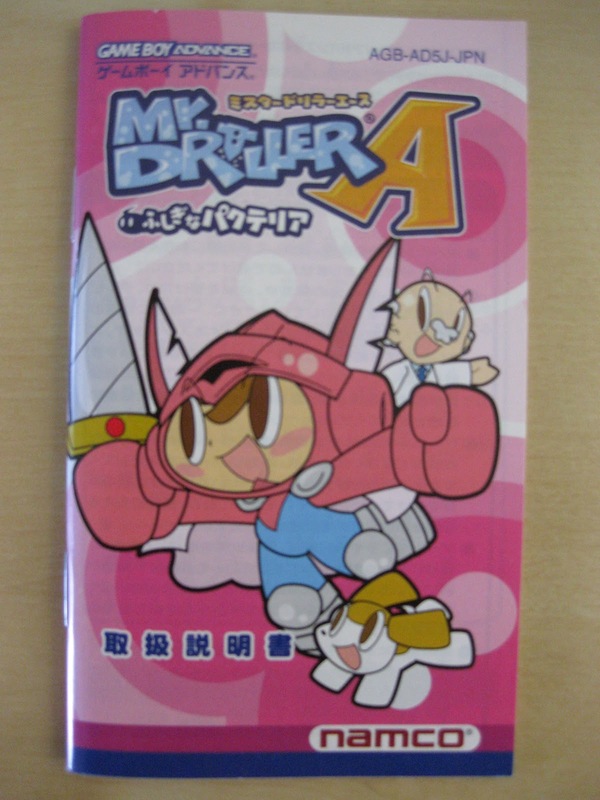 Mr. Driller A, or Mr. Driller Ace: Wonderful Pacteria, never made it outside of Japan, and it's a real shame, as it's my favorite title in the series (but I don't claim to be much of an authority). 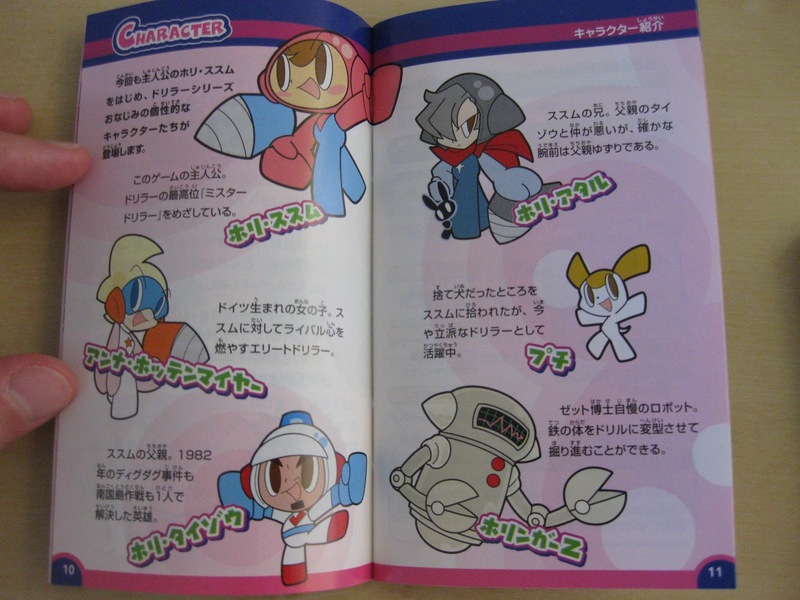 Though the manual isn't particularly outstanding, it does feature the series' iconic art style in the form of some character illustrations and screenshots. 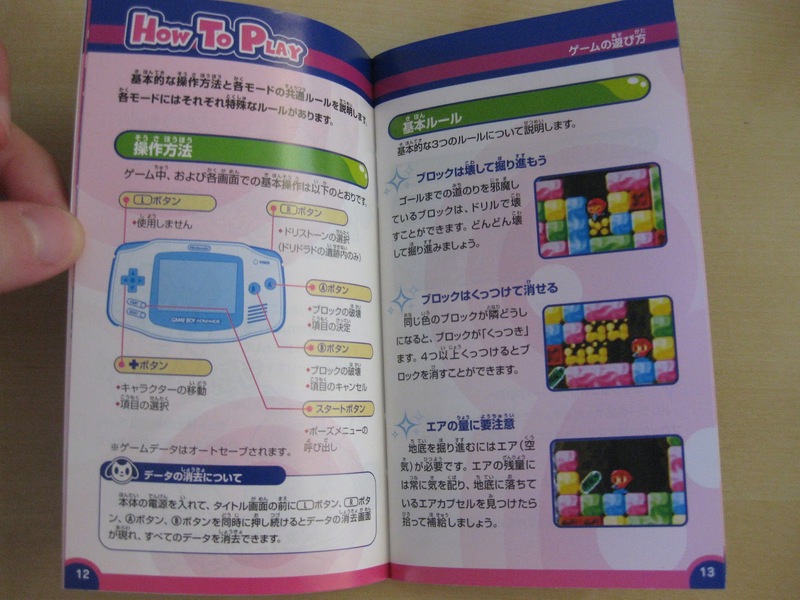 This manual is surprisingly large for a puzzler, but most of the pages really aren't all that exciting. 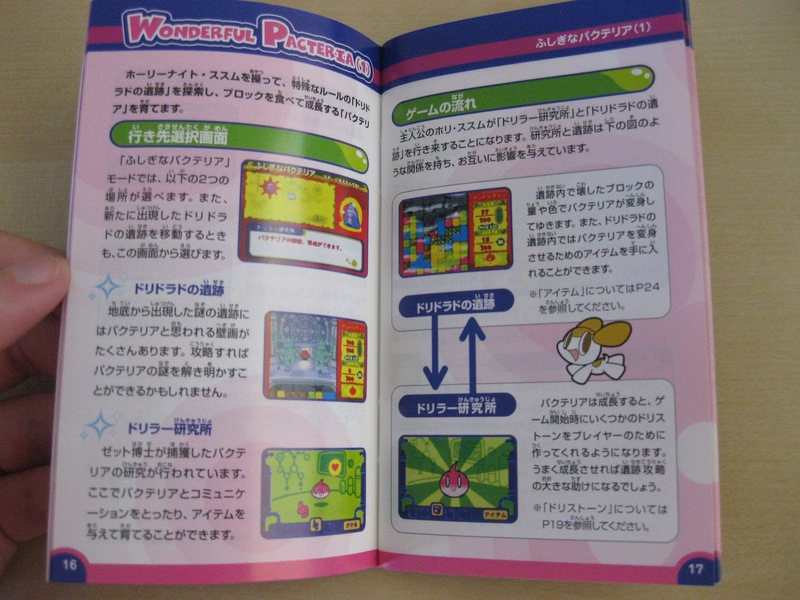 The first, and arguably my favorite, features a silly illustration of Susumu and his sidekick dog Puchi looking bewildered at a "Pacteria," the weird black blob thing that makes an appearance in the game's subtitle. 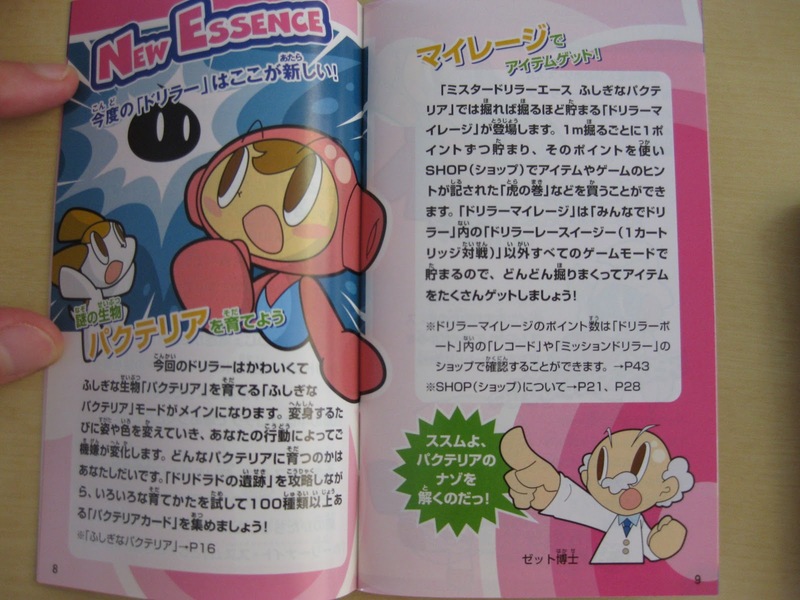 Gotta love the professor urging Susumu to uncover the mysteries of the Pacteria, and the words "New Essence" splashed across the top left page. 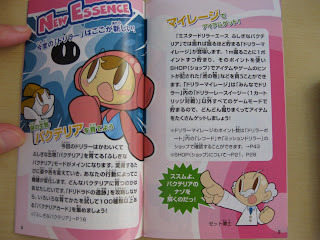 Character pages are usually pretty fun, and this one's no different. Anyone familiar with Dig Dug should recognize the fellow down in the bottom-left corner! 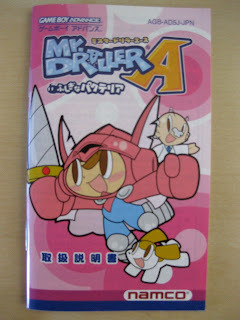 That's Taizou, Suzumu's father and main character of the iconic Dig Dug series. His birthdate, 1982, is the year Dig Dug was first released in arcades. 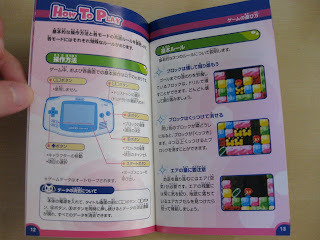 The subsequent pages are all relatively standard "how to play" fare. I wonder what's so wonderful about those Pacteria? 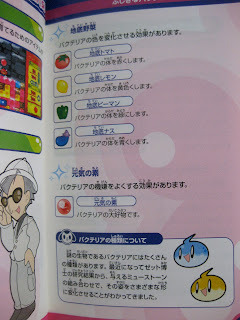 No proper puzzler would be complete without fruit and vegetable power-ups! These all change the color of the Pacteria in a mode unique to Mr. Driller A. Admittedly, I haven't played much of it, as the traditional modes have captured most of my attention thus far. 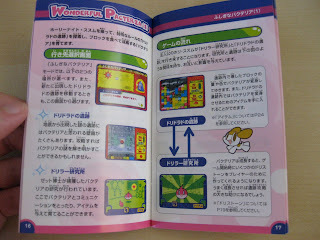 But considering the Pacteria are so prominent in the manual, perhaps I should give the game's namesake mode a go? And what's that creepy, bug-eyed professor got to do with anything? It's funny to think that this game is 10 years old this year. I'm not sure whether that feels like a long time ago or just yesterday! 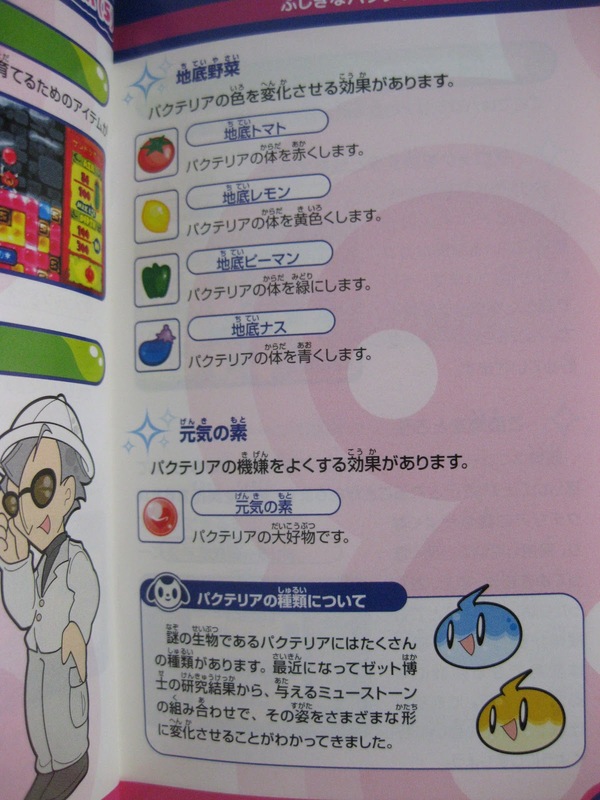 Anne is a Japanese game enthusiast who collects a lot but doesn't play nearly enough. 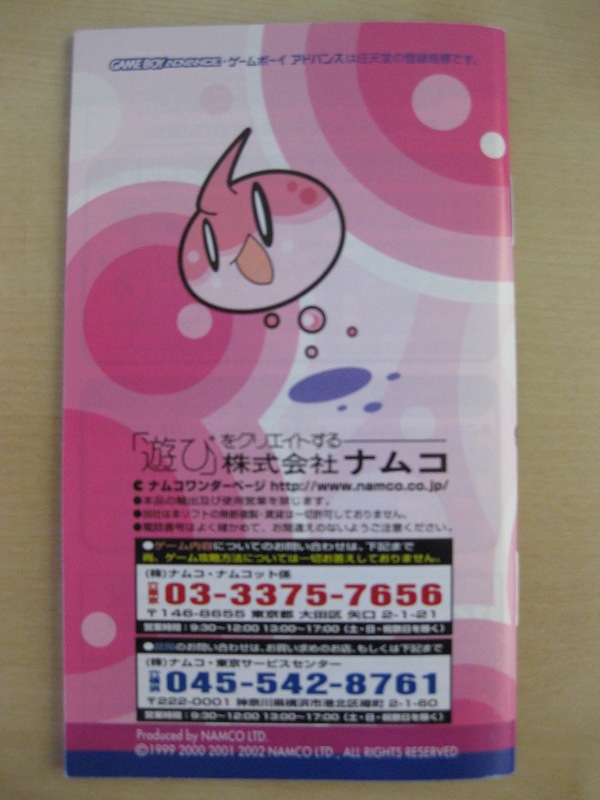 She's writing a thesis on boys' love manga, holds an editorial position at videogamewriters.com, and does freelance translation on the side, which is probably why she doesn't have as much time for games as she'd like. You can find her on Twitter (@apricotsushi) or her personal blog Chic Pixel (chicpixel.blogspot.com). Yeah. Wow! She fits right in around here! And...now I'm WAY curious about the title mode of this game. I am, too, Justin. I've had my eye on this game for ages, so hopefully this post will prompt me to finally pick it up. Don't know where else to post this Bryan but I'm getting email confirmations of your posts on my blog but they aren't appearing on the page, I'm not sure what is wrong? Anyway as for the negative word of mouth about Fragile I agree totally with it but I also think it's exaggerated and none of it is the game killer some reviews make it out to be. No worries, Retr0gamer. I think me last/most recent comment was posted at least. Sorry for the quality of the pictures... I REALLY need a scanner in my life. But Bryan and others who scan your manuals... Do you find that ruins the spine? Or do you not mind that? Hey there, Anne! Oh, don't worry about the photos -- I actually like them. It makes the post seem more personal, in a way. As for whether or not scanning manuals ruins the spine: Most of the manuals I've scanned thus far have been pretty thin, so opening them flat hasn't mattered much. Also, after I scan them, I close them back up and then let them sit in the scanner for a bit (so the spine goes back to normal, if needed).